From the shortest crossing, Dover - Calais, to the longest, Hull - Zeebrugge and Plymouth - Roscoff, there is a good choice of ferry and tunnel operators running from a number of UK ports. ► Booking directly with the ferry company protects you from any possibility of a third-party failure, and may make it easier and cheaper to change or cancel a booking if you have to change your ticket. Though take note: most of the cheapest tickets available are now sold on a "no change / no refund / no cancellation" basis, and in this case it make little difference if you have booked directly through the ferry company, or through a fare-comparison site. And since the cost of a flexible ticket is almost the same as the cost of a new cheap-rate ticket anyway, paying extra for flexibility doesn't make sense unless you really think you might miss that ferry ! ► Which route ? It depends on your priorities, and where you're going. Price :For the cheapest crossings, take a ferry from Dover, and avoid peak periods and peak hours. Early morning or late night crossings are cheapest. Convenience : (and maybe price and speed too) Drivers bound for the western half of France or Spain should check out crossings from Portsmouth or further west. They are more expensive, but can result in much shorter driving distances. For example a journey from the western outskirts of London to Tours or anywhere in southwest France involves about 320 kilometres or over 200 miles less driving if taking a Portsmouth-Caen crossing, rather than Dover-Calais. Or a trip from Birmingham to central Normandy is a 500 km drive via Portsmouth but 820 km via Dover. By taking a night crossing, you can also save time or a hotel bill. 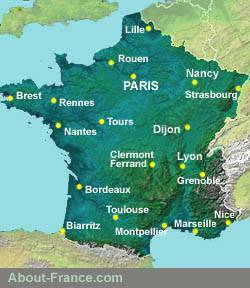 The shortest and quickest services to France. Poole - Cherbourg Brittany Ferries Daily 3 Jan to 8 March, then 30 Apr. to 01 Nov. One sailing a day usually at 8.30 am - outward. France in general Travel Living and leisure Other chapters. ►This page includes links that will take you directly to the ferry company's own website where you can book online at lowest rates. Best routes, route maps , route guides and easily accessible places to stay.